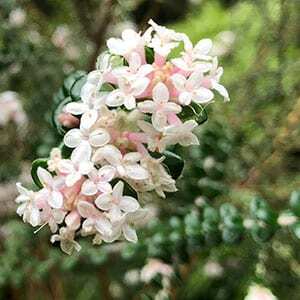 Although it is not widely grown, Pimelea nivea does have attractive white or pink flowers, however the foliage is also a good addition to the garden. Small rounded leaves, deep leathery, glossy green with a felty underside make this an attraction year round. Most commonly round in Tasmania. Grow Pimelea nivea in a humus rich well drained soil slightly on the acidic side. It will flower in morning sun and light afternoon shade and requires little in terms of fertiliser. Give the plant a little room and it will develop a more bushy habit than it will if it needs to reach for light. Prune after flowering, however not back into old bare wood. This will also assist with creating a more rounded dense growth habit. Flowers – Small and creamy white or pink. Foliage – Interesting deep green, glossy oval shaped foliage . Not widely available for sale.